It’s one of this reviewer’s pet peeves: a cool little spectacle that you glimpse on TV, say, or YouTube, only to have the thing promptly overexplained in the media and online. It’s still a bit disappointing to remember the urban dancer who stole the ad show during the Super Bowl a decade or so ago by crazily pop-locking his way through a Levi’s spot. Was it a special effect? Who was the guy? Not knowing was kind of fun — while it lasted. The unabashedly sentimental documentary “Batkid Begins” would seem to be a setup for something similar. Coverage of the film’s subject was so ubiquitous, you’re no doubt familiar with the basics: Five-year-old California leukemia patient Miles Scott told the Greater Bay Area chapter of the Make-a-Wish Foundation about his dream of being Batman. 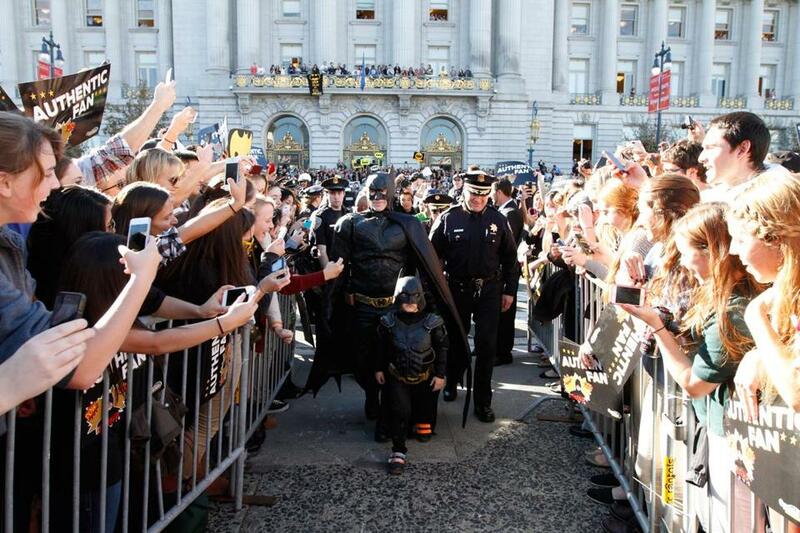 The boy’s wish resonated so widely that for a day in 2013, San Francisco transformed itself into a kiddie version of Gotham City, complete with super-villainous plots for Miles’s Batkid alter-ego to foil. Could there be much point to documentarian Dana Nachman piling on with yet another account? Turns out there is. (We’ll reserve judgment on the Julia Roberts dramatization reportedly in the works.) Much of the feature’s validity lies in the remarkable way that the Make-a-Wish effort was driven by the endless reach of social networking. A dizzying sprawl of volunteer contributions and active public participation figure into the Batkid story, and Nachman capably, straightforwardly orders it all into a definitive narrative. She’s clearly also dealing with material that has an inherent cinematic quality, and there’s some entertainment in seeing superheroic production values applied to Miles’s pint-size exploits: rescuing a woman tied to cable car tracks, thwarting the Penguin’s kidnapping of the baseball Giants’ costumed mascot, etc. The movie also makes generally judicious choices about which voices to highlight. We hear a lot from a likably energetic Make-a-Wish exec amazed by how her initially modest Batkid vision took on a life of its own. Then there’s Eric Johnston, the acrobat, inventor, and overgrown kid at heart who suited up as Batman to accompany Miles. There are also some great sound bites from “Dark Knight” composer Hans Zimmer, who supplied a musical snippet for the event. Mercifully, we hear only briefly from one or two folks who aided the Batkid phenomenon while seemingly missing the altruistic point. Nachman, for her part, diligently tries not to lose sight of the child at the center of it all. An efficiently comprehensive intro lays out Miles’s case, the way that his cancer upended his family’s humble, farm-country existence, and the resilience it took for him to get through his treatment. And there’s acknowledgment of the tricky balance between a 5-year-old’s stamina and giving a crowd of thousands the full feel-good show it’s expecting. In the film’s most touching sequence, we see how much joy Miles gets simply from doing some preparatory tumbling at a superhero academy (read: circus school), unaware of how much more is to come. It’s not as clichéd as if they had joked that he just wanted to play with the box his Batsuit came in, but it’s a sweet reminder of whose story we’re watching.